Reprinted courtesy of TAAF: Terres Australes et Antarctiques Françaises (French Southern and Antarctic Lands). TAAF is an overseas community that has administrative and financial autonomy, thanks to the law of 6th August 1955; the law revoked the decree of 1924, which linked the lands to the general government of Madagascar. In December 2010, Guy Pérazio an expert surveyor carried out a campaign with his practice, to digitise the whaling station at Port-Jeanne-d’Arc in the Kerguelen Islands in 3D using photography and topography. The first stage of the programme consisted of flying over the station in a helicopter in order to take aerial photographs of as much of the site as possible. These photographs were then compiled into a ‘scatter diagram’ of points as well as obtaining the necessary textures that would be used later in the 3D work. Four stations were placed on the ground and twenty-two spheres were used as reference points, which covered the whole site. The stations were also used to identify points that the scanners found difficult to access or were invisible to them (ones that were too far away for example). The spheres, called ‘ears’, are spread out, referenced and located in sensible, well thought out places. When the site is physically ready, the scanner can carry out a plot of the points. The interiors of buildings are also recorded. During this time, the textures are acquired using photographs. Overall the texturing of the horizon lines was completed using 545 photographs of interiors and exteriors as well as using 360° panoramas. It took 46 hours of work in order for the scanners to capture 4 million different points. These millions of points were then ‘cleaned’ electronically or ‘colourised’ to make them more easily legible. When the points are all linked, they form a network over which the photographs can be placed; the old ones taken several decades ago, as well as the newest ones. The computer engineers at Pérazio’s practice carried out this step. By looking through archives and at past photographs, we are rebuilding the memory of Port-Jeanne-d’Arc and restoring it to its former glory. 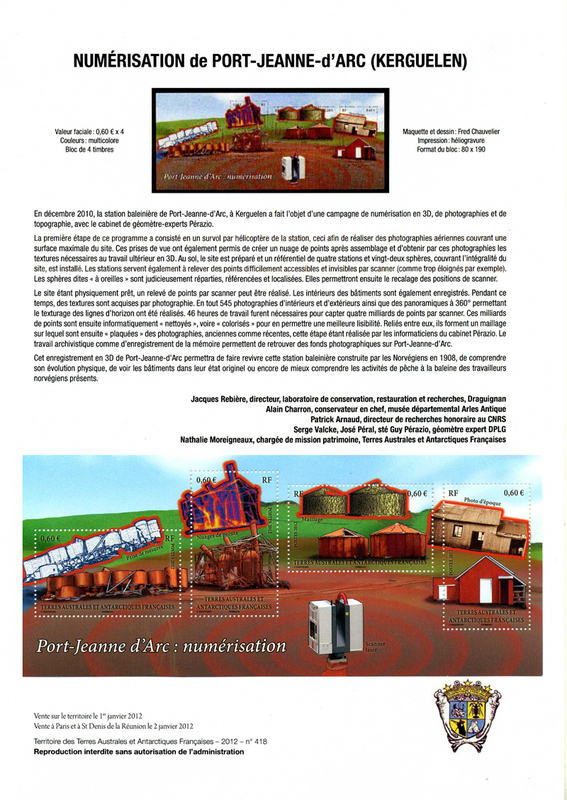 This recording of the Port-Jeanne-d’Arc in 3D will help revive this whaling station built by the Norwegians in 1908, to understand its physical evolution, to see the buildings in their original state and to better understand the whaling activities of present Norwegians.